I received 2 blog awards today!! So AWESOME!! I am going to combine them because I don't think I can come up with enough things about myself to do them seperately. 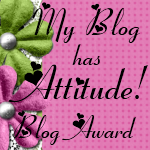 I received the Attitude Award from Alina from Addicted to Scrapbooking. 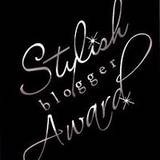 I received the Stylish blogger Award from La-kesha from What's Scrappin'. 1. I am a Christian and very proud of it! 2. I am a loyal wife, daughter, mother, grandmother and friend. 4. My crafts keep me sane. Without them I wouldn't know what to do and probably get into way too much trouble. 5. I refuse to drive in the snow unless it's absolutely necessary. 6. I am a big baby when I'm sick. 7. I always find a way to see the best in people. 8. ﻿I am not all that creative but I follow directions really well. I am giving this award to everyone reading this post. I really, really appreciate everyone that follows my blog because they give me encouragment.